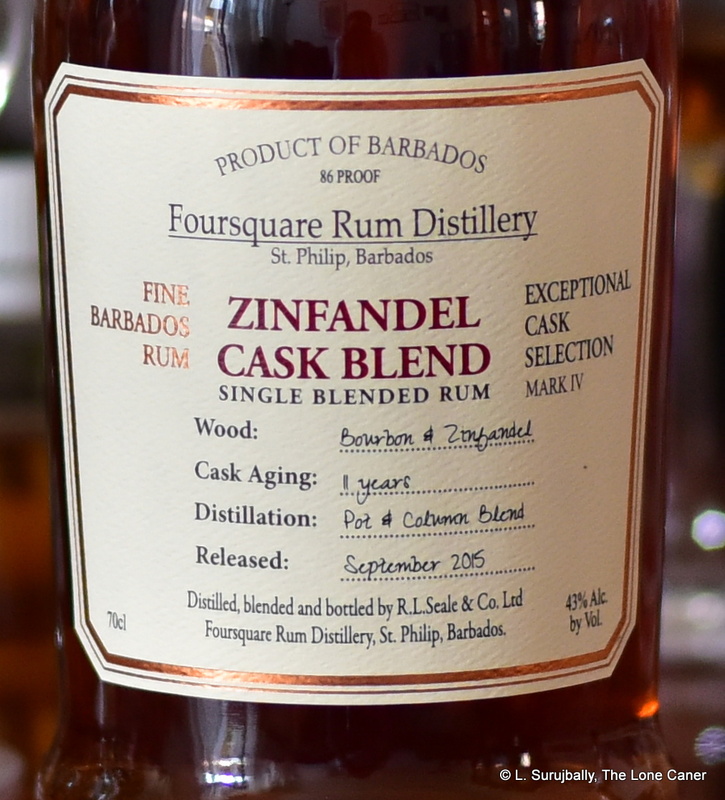 It’s odd that the fourth Exceptional Cask Series rum issued by Foursquare out of Barbados was issued at such a low proof. The “1998” and “Port Cask” Marks I and II were both released at 40%, but the very good “2004” Mark III went higher, much higher (59%) and carved itself a solid niche all its own – in contrast to the emerging ABV-creep, the Zinfadel dialled itself down to a relatively mild 43%. Perhaps, since both came out in 2015 it was felt to be a smart move to have one rated G just to offset the R-rated predator that was the “2004”, or to appease the importers who made Foursquare issue the first two Marks at 40%. Which would make sense, though for my money it remains an incrementally lesser offering from the House of Seale’s ECS, (an opinion I hold largely because of the great stuff that emerged after this one). The Zinfadel 11 Year Old is a blend of batches of rums: one was aged for five years in bourbon casks and then another six in zinfadel barrels, and then married with another batch that had spent the full eleven years in bourbon casks. 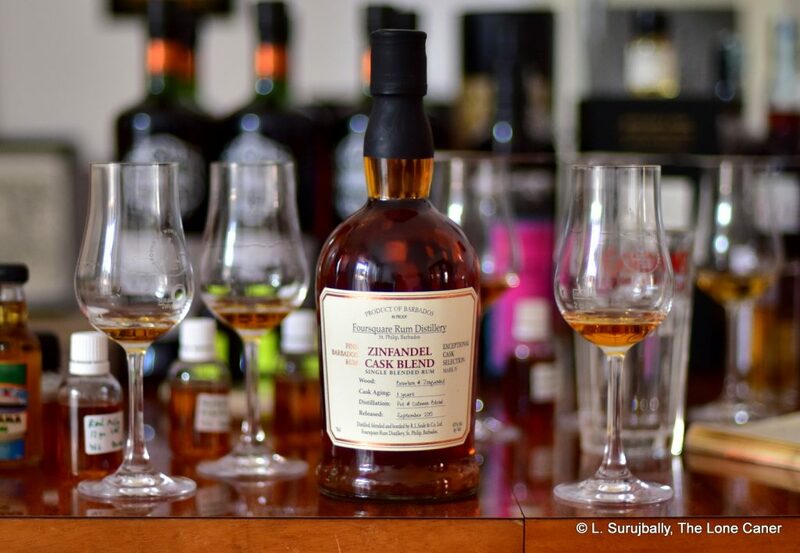 Unusual for the time (2015), Richard Seale went around in person to the various international rumfests, masterclasses and private tastings, and started his engagement on social media (he does this more than any other primary producer I’m aware of), trumpeting the fact that nothing was added, the rums weren’t filtered and the casks were dry, dry, dammit – not wet or with residual wine sloshing around (an old trick to flavour rum more definitively). Tasting revealed somewhat less clothing in the suitcase, though it was quite a decent rum to sip (mixing it is totally unnecessary) – it was a little sharp before settling down into a relative smooth experience, and tasted primarily of white and watery fruits (pears, watermelon, white gavas), cereals, coconut shavings, sweet wine, and had a sly hint of tart red fruiness that was almost, but not quite sour, behind it all – red currants, cranberries, grapes. It was quite light and easy and escaped being an alcohol-flavoured water in fine style – not bad for something at close to standard strength, and the touch of sweet fruitiness imparted by the Zin barrels was in no way overdone. Even the finish was quite pleasant, being warm, relatively soft, and closing off the show with some tart fruitiness, coconut shavings, vanilla, milk chocolate, salted caramel, french bread (!!) and touch of thyme. Overall, quite an impressive dram for something so relatively staid in its strength. The nose is really the best part of it, though it does promise quite a bit more than the taste eventually delivers. With the light tastiness of the three parts – aroma, palate and finish – it’s easy to see why it remains a fan favourite. And while it’s not one of my favourites of the Exceptional Cask Series (so far the Criterion holds that honour for me), it beat out the Real McCoy 12 YO handily, is within spitting distance of the 2004, and is a worthy addition to the canon of the Exceptionals. I’d buy it again…and the nice things is, three years after its release, I still can.